There was a very popular tradition on the Greek island of Santorini until recently, where tourists didn’t have to walk all over the island. Instead, they could ride donkeys as a means of transport. The tourists were able to pay to rent a donkey and then climb on it to travel all over the iconic cobblestone steps of the island. But thankfully, the donkeys won’t have to suffer anymore, as Greece has completely banned overweight people from riding the donkeys. The Greek Ministry of Rural Development and Food recently published some new regulations for the donkey rides, after they received many complaints about the well-being of the animals. After being ridden for a long time, the donkeys on these islands started suffering from open wounds and spinal injuries. 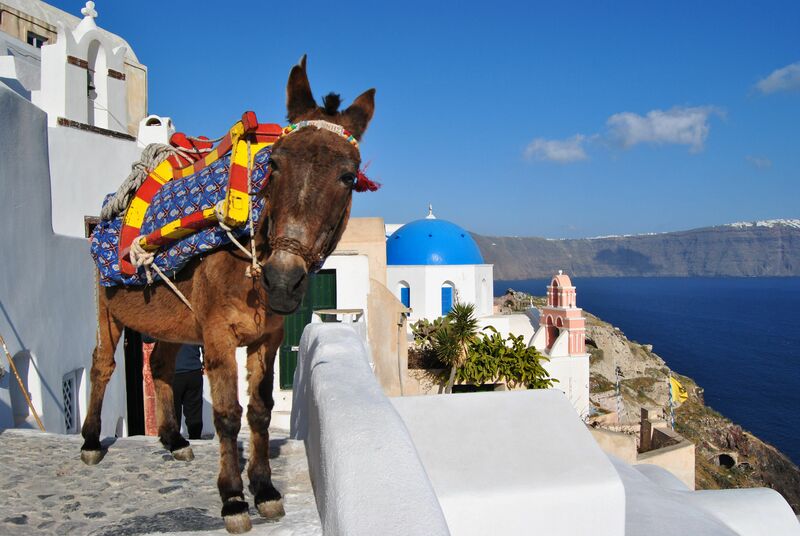 And a while ago, there were plenty of images that surfaced online where obese tourists were getting around the island of Santorini one these donkeys. And a spokesperson for a Greek charity called Help the Santorini Donkeys even said that the locals were resorting to using cross-bred mules for this business because the regular donkeys weren’t strong enough to withstand the toll it took on their bodies. Others have stated that these donkeys were forced to work all year long, with no adequate shelter, water or even rest, and were often barely alive when working. And with the number of tourists that visit these islands each year, having this ban in place is great news for the animals. With this restriction, the state donkeys that are allowed to give the tourists rides are no longer allowed to carry any weight heavier than one-fifth of their own, which is about 220 pounds (100 kg). Furthermore, the government issued further restrictions that state the owners of these donkeys should make sure that the level of health of each animal is high. Which means there will no longer be any injured, pregnant or ill animals carrying around tourists on their backs in the scorching summer heat. Finally, the ban states that the animals need to be given the adequate and the appropriate food, as well as fresh drinking water every day, and all food and drink containers should be cleaned at least once per day. The next step for the animal rights activist groups is to outright ban the use of animals as slaves since there are plenty of donkeys across the country that are still used to carry appliances, cement, and other heavyweights.